Pick up your cell phone, it’s likely one of these four companies is your provider. And if they’re not your provider, it’s likely whoever you pay your cell phone bill is using one of their networks to deliver your service. Check your wireless router at home, there’s a good chance one of these companies is behind your Internet connection. If in the near future you can’t access your favorite websites because they’re being blocked or slowed down, well you can thank this conference for destroying the Open Internet. Like their technology which is invisible to the eye, their influence on our lives is significant but hidden. They are the WIRELESS CONFERENCE. Verizon weighs in at over 115 million mobile customers in the U.S. easily making it the top dog in the cell phone market. Verizon also spent more than $13 million last year lobbying Congress and the FCC. They spent millions more suing the Federal Communications Commission over its open Internet protections, and won. And when they’re not completely decimating the Internet, they also find time to force its home customers to switch a “wireless” landline service that doesn’t work as well as traditional telephones. T-Mobile on the hand, has making waves in the Wireless region by being the first of the Big Four to get rid of those pesky 2-year contracts. That do-gooder attitude might play well with their 33 million customers but in Media Madness that will only guarantee you a quick exit. 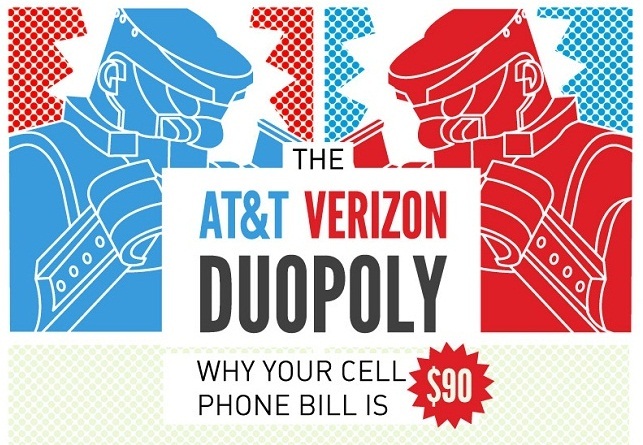 On the one hand the former telephone monopoly turned one-half of a two headed Wireless monster outspent Verizon in lobbying Congress and the FCC ($16 million). On the other hand, Sprint didn’t follow proper protocol when it laid off over 1,400 workers and may owe close to $5 million in back pay. On the one hand, AT&T is a big financial supporter and member of ALEC. On the other hand, so is Sprint. AT&T is a bigger machine that successfully rebuilt itself after the original “AT&T” monopoly was disbanded in the 1980s to create the “baby bells”. They’ve lobbied their way back since then and alongside Verizon, dominate the wireless market. Sprint didn’t have a chance. Up until the 1980s, AT&T aka Ma Bell had a monopoly in the telephone market. The government decided to break up this monopoly and divided up the company’s assets into “baby bell” companies. Since then, these baby bell companies have slowly merged and put themselves back together like Sauron from Lord of the Rings. What remains of the baby bells are two companies, Verizon and AT&T. These two behemoths wield a lot of power in Washington D.C.. Both are big contributors to political campaigns, advocacy organizations, and are among the top spenders every year in lobbying expenses. Both have been intimately linked in whistleblower Edward Snowden’s revelations in the NSA’s mass surveillance activities. Verizon has waged a war on the Open Internet, successfully suing to eliminate the FCC’s net neutrality protections. Without the open Net, Verizon gets free reign to block and slow down Internet traffic to force websites to pay it a premium to deliver their content to its users faster as Netflix recently did. AT&T on the other hand is waging war on regulation. At the state level, ALEC supported bills are strippling local government of the power to build their own broadband networks and regulate the telephone industry. The winner is a company who uses a natural disaster as an excuse to no longer offer landline telephone service and force customers to switch to a less reliable service. This winner may have possibly ruined the Internet forever. Your winner of the Wireless Conference: Verizon Wireless. The losers: All of Us. That’s the breaks…. 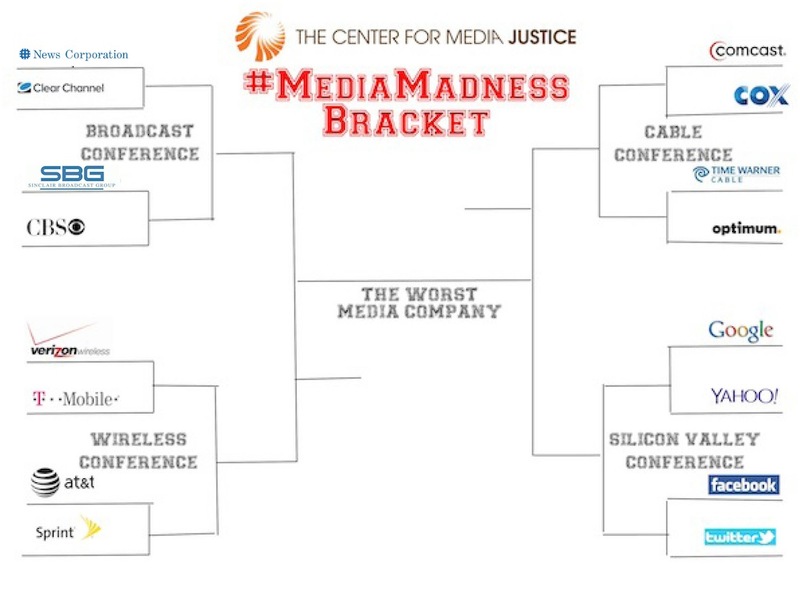 Chime in online using #mediajustice and share with other people. And don’t forget to join our action list, yes these problems are madness but together we can change this.